Shri Lanka Youth Climate Summit HERE I COME! I will be going to the country of Sri Lanka January 13th through the 25th with the Wild Center, to present at Sri Lanka’s first ever Youth Climate Summit. I am very excited to have been picked out of a handful of students that have worked with the Wild Center Youth Climate Program. I will be traveling with two Wild Center staff members and a close friend that has also been very involved in the Youth Climate Summit program. 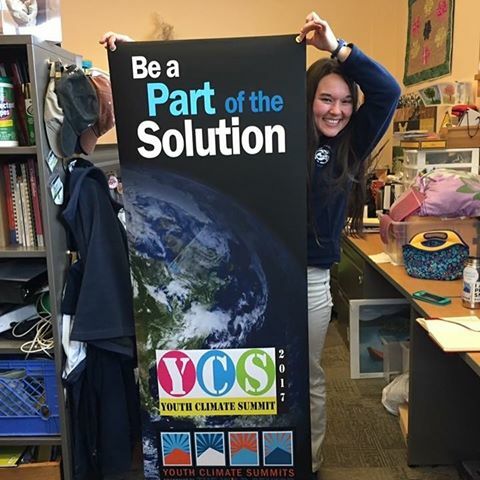 As a group, we will be presenting in a large plenary session as well as directing a couple small workshops to help teach the students there about the science behind climate change and come carbon reduction strategies The Youth Summit will give students resources to design a carbon neutrality plan to bring back to their schools. With their plan they can begin to take steps towards carbon neutrality in their own schools and communities. I am very excited to be able to be a part of this! I will not just be there for the summit. We also plan on seeing many of the incredible attractions the island nation has to offer like its many Buddhist and Hindu religious temples, beautiful beaches, and an elephant orphanage. I have never seen an elephant outside of a circus, so i’m pretty pumped for that last one! I have been told that we will be able to check out the nation’s capital Colombo, and learn about the country’s diverse culture and history. I also can’t wait to try the unique food. I already have my plane tickets booked and an approved travel visa. Since there are no direct flights to Sri Lanka I will be flying out of Lake Clear to Boston. From Boston I will go to Dubai and then Colombo. It’s over thirty hours of travel both ways. It will be worth it. However before I go I have a list of things to do before I get on the plane. It will be my first time immersed in a completely different culture so I will be reading up on how not to offend anyone by being an ignorant tourist. Sri Lanka just finished a civil war in 2009 and it’s a sensitive subject. The country is very diverse with several languages and religions because of this there are certain guidelines we need to be aware of. I would like to represent the college well. A couple things I know so far is that I’m not to touch anything of value with just my left hand or take a picture with my back to any government buildings, religious temples or sacred sights. In preparation I will also have to get several immunisations, many of which I have started on. I have never been in a tropical climate for more than three days at a time so two weeks could potentially be quite a shock to my system. Luckily most of the island speaks English so if there are any issues we shouldn’t have to deal with a language barrier. I have also started looking into what issues the island itself is facing because of climate change. Most island nations have their biggest issues with sea level rise submerging them. Sri Lanka is very steep and mountainous. There are only a few places on the island that rising oceans pose a big issue. From what I have read so far the biggest issue they are facing because of climate change is how the monsoon seasons that they depend on for farming and fresh water have been altered. This poses a risk for extreme drought and food shortages. The island is also very close to the equator and has been seeing more intense and increasing frequency of extreme heat waves. I’m sure when I attend the Youth Summit I will learn about even more issues the island is facing and their creative solutions to do their part to combat climate change.